I had previously blogged about the GreekBibleStudy site, but I want to mention it again in light of some other recent comments. Second, I have blogged about attempts to develop a 'graduated reader' for the Greek NT as a way to help students learn Greek. I had forgotten that this site does just that. It's keyed to Mounce's Basics of Biblical Greek, and one can choose which chapters to have reflected in the coding. In the screen capture above, the first column is the NASB (KJV and ASV along with a Chinese and Spanish version are also possible), the second is Tischendorf's text color-coded according to parts of speech, and the third is the Greek graduated reader. Nice. Instead of Mounce, though, I'm looking for a progressively enabled view like this that is simply based on vocabulary. A new site I found that may be helpful in learning Greek (though there is more interest in modern or classical Greek, and there are pages for just about any other language) is italki. Check out the resources. Finally, more just to have fun and mark your spot in the cloud, there is Facebook. 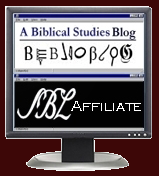 There is a "Logos Bible Software Users" group you can join, though it has little activity. More fun and a little more active is the "The Only Good Language Is A Dead Language..." group, and I have actually found some good resources through here. You can find them by searching groups. Looks like a great site. It's been a couple years since I took my intro to Greek course and I'm trying to refresh myself. 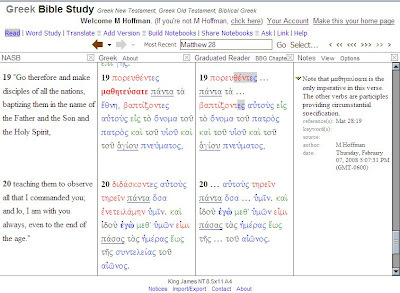 We used Mounce in the course and the graduated reader on Greek Bible Study sight looks very useful. Appreciate the time you put into this blog providing us with the info! BibleWorks7 Graphical Search Engine and More!